3" Round shatterproof ornament with the ATHS Logo imprinted in black. Available in silver, gold, green, blue, and red. Every card is adorned with black ATHS Logo on top of a gray diamond plate pattern. Standard poker sized playing cards wrapped in cellophane and placed inside a white window box make for a great gift item. The Keychain Bottle Opener is a stylish and convenient way to open bottles and show your ATHS pride. The chromed solid steel construction ensures that you can pop cap after cap without it bending or breaking. The opener prominently features the ATHS logo that won't fade or wear off over time. And with the attached key ring, you can be confident that it's always by your side. At the office or on-the-go, this ATHS logo tumbler is certain to be a new favorite accessory. Features: 15 oz. capacity, double wall insulation, plastic liner, flip-top lock lid. ATHS boxed set of 2 absorbent Stone Coasters. Keep your truck/car cup holders clean with moisture absorbing stone coasters. American Truck Historical Society logo in the middle of each coaster. Car flags are a great way to accessorize your car or truck. 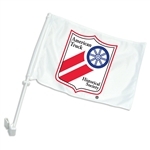 Let everyone know you support ATHS with this logo printed flag.